Responsibilities: service computer and office equipment. Responsibilities: development of casual games. 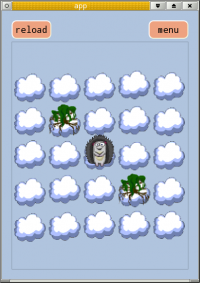 In this game you have to choose an initial position for hedgehog and then control him such a way, that he visits every cloud for once only. If he starts he will move until bumping. The program was developed on C++ with Qt library. The source of the project is open, game is available on google play market.